In keeping with the trends of decluttering and minimalism, the latest interior designs are heavily inspired by the beautiful simplicity of Scandinavian style. The hallmarks of Scandinavian style, sometimes dubbed “Scandi chic,” are minimalism, simplicity and comfort. 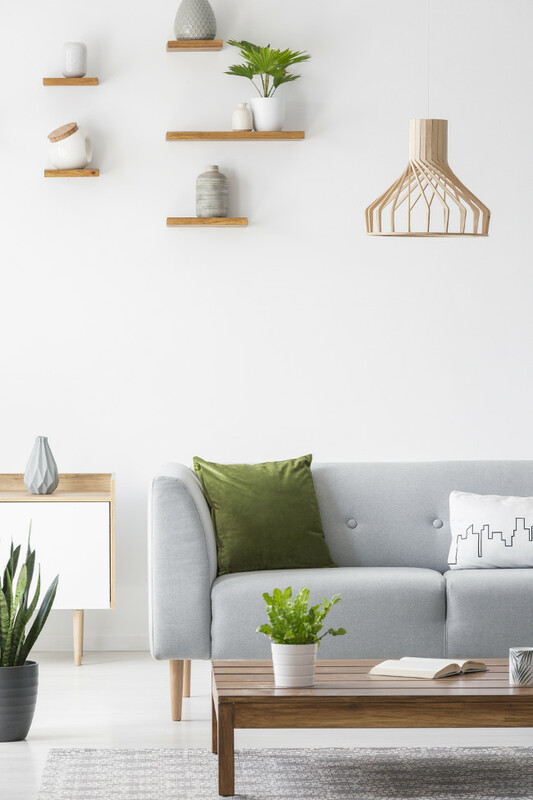 If you are hoping to transform your home decor and adopt this style of interior design, then the six tips found below are perfect steps towards achieving the functional elegance of Scandi chic. Scandinavian style is heavily influenced by Nordic surroundings, the designs are centered around the beauty and functionality of nature. 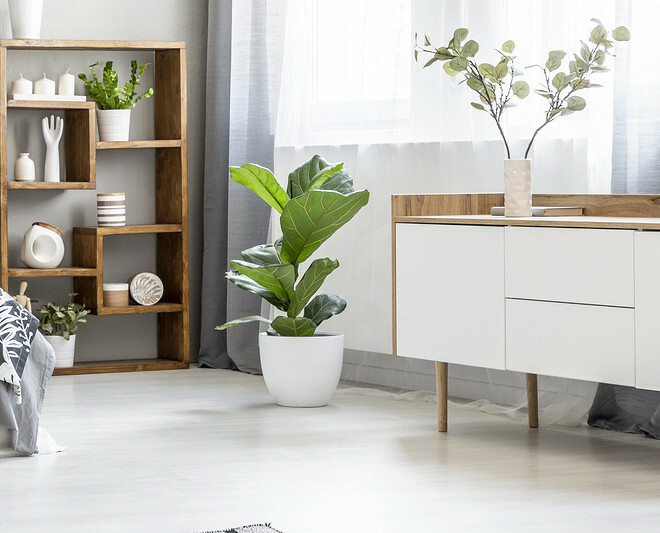 This is reflected in all aspects of Scandinavian home decor, but it is especially easy to spot in the materials that are used for furniture, flooring and accents. Due to the general affinity for nature, it is common to see homes that feature extensive use of natural stone, ceramic, glass and wood. Wood is a particularly common material used for furniture, furniture accents, flooring and decorations. The Nordic regions are dense with light-colored woods such as pine, birch, aspen, alder and elm, and these are used extensively in all aspects of interior design. Not only are these woods plentiful, but they also add a sense of lightness and spaciousness that many in the region crave. Materials such as slate, natural stone and ceramic are all utilized to not only connect a person with nature but also to ground the space and add texture and depth. Blond woods are excellent for contributing an airy, spacious feel to any interior, but they need to be tempered with accents of something more substantial to give the room a balanced, peaceful atmosphere. Metal is another popular texture that can be found in many Scandinavian style homes. Wrought metal pieces and sleek rose gold accents can be an excellent way to bring a subtle earthiness into a room. Since Nordic homes are often small, their interior design styles usually show the importance of functionality and minimalism. This doesn’t mean your home needs to be immaculate but you should focus on pieces that showcase simple elegance while maintaining functionality. In many cases, you will find that the ability to easily store items out of sight can immediately lead to a feeling of peace and an immense sense of tranquility or joy. This is yet another secret to why living in a Scandinavian-inspired home has become so popular. Almost every Nordic style home features extremely basic and neutral color schemes. Gray, white, cream, beige and blond are the predominant colors in almost any Scandinavian space, and no truly Nordic interior is complete without a heavy reliance on these colors. The reason for this affinity for bright whites and light neutrals is twofold. First, it is common for space to be limited in houses and apartments, so it is important to make rooms feel as spacious as possible. Second, the cold season in countries like Iceland, Norway, Finland and Sweden can be quite dark and brutal. People often spend a lot of time inside their home instead of outside. Therefore, by having light and neutral colors in the home your space will feel less dark and more open and airy. 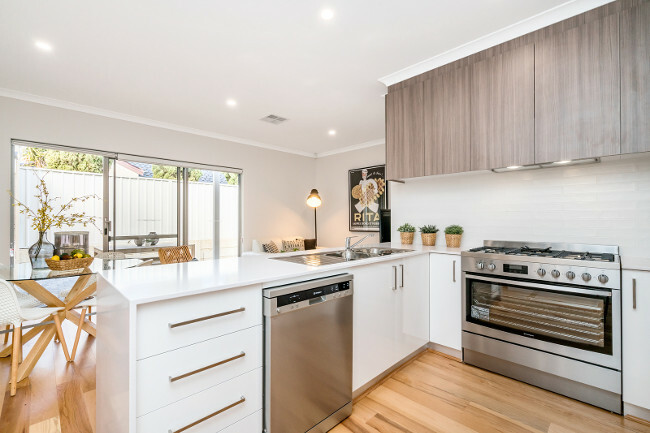 Likewise, by focusing on light, bright neutrals for the majority of the room, you can capture as much natural light as possible and help the space to immediately feel more welcoming. Relying on darker neutrals and muted accents helps to give the room depth and visual interest. 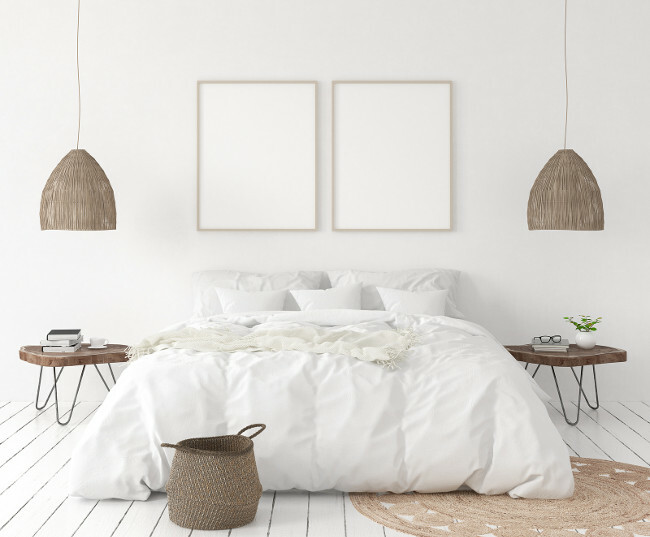 It’s popular in many Nordic spaces to paint the walls in a bright white or cream so that the natural light can flood in and reflect throughout the room. To balance this brightness, the room is then grounded with rich yet understated colors, deep, earth-toned neutrals and natural textures. Striking this balance can be tricky, but it is extremely rewarding. Many Scandinavian design schemes will incorporate either pastels or muted tones such as olive, burgundy, chocolate and navy blue. As rose gold and its related hues have recently become trendy, it is also common to see rose gold and similar tones such as dusty pink, muted coral or salmon incorporated into a room’s palette as well. The key to truly pulling off the Nordic style of home decor is to understand the interplay of colors and how to tastefully add visual interest without overwhelming the general sense of tranquil lightness. In Scandinavian countries like Denmark and Norway, cozy is more than just an adjective. For them, it is a way of life. In fact, there is a specific word they use to describe this special brand of comfort: hygge. There is no precise English translation for hygge, which is pronounced “hoo-gah,” but it is often described as an all-encompassing contentment, comfort and quiet joy. If you’ve ever experienced the feeling of being relaxed with soft blankets, candles and a warm drink, you can imagine the general feel and simple elegance of hygge. This concept goes beyond just filling your home with creature comforts, however. Hygge extends to all aspects of your life, but it starts at home. This idea of grateful contentment is centered around creating pockets of “practical sanctuary” in your life, and it is embraced as a way to stave off seasonal depression and practice feeling connected to community and nature. The wholesome and nurturing nature of hygge is easiest to embrace through how you choose to fill your home. True Scandinavian chic is understanding how to create this feeling of contented coziness without excess. Warm blankets with interesting textures such as shearling, fur or chunky woolen knits in subdued colors and patterns are a simple way to add both personality and comfort to a space. 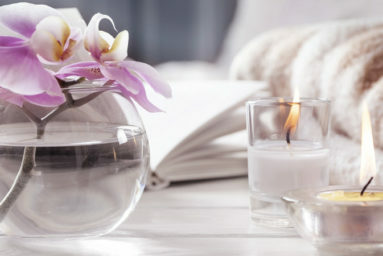 Another way to do this is to utilize softly scented candles in unique glass holders, or you can even set them on simple ceramic or rose gold plates to draw the eye while protecting your furniture from wax drips. Choosing furniture that is both stylish and inviting is a great way to convey a feeling of hygge in your home. For example, your sofa could have a unique shape but be upholstered in supple leather or soft fabric. You can even add a few tastefully arranged decorative pillows for additional warmth in your space. These pillows can be as understated or bright as you choose, and they can be any shape or size you prefer. Don’t be afraid to play with pops of color and texture with accent pillows, but make sure they are soft and comfortable. Some spaces can even benefit greatly from large rugs, overstuffed floor cushions and minimalist end tables with rose gold hardware. If you choose to add a rug, it should complement the textures and colors already present in the room. This helps to give it a more cohesive and intimate feel without cluttering the room or making it feel small. Another interior design concept that goes hand-in-hand with hygge is the Swedish word “lagom.” Hygge is about small, gentle comforts, and lagom is about balance and moderation. Both of these ideas discourage extremes of both sparseness and luxury, and they instead hold the concept of “measured experience” in high regard. An example of this would be enjoying a humble, homemade dinner with close friends rather than spending lavishly on a meal. This allows you to have the rich experience of closeness and good food, but the joy is quiet and more restrained. The ideas of hygge and lagom are both common in the Scandinavian style home. 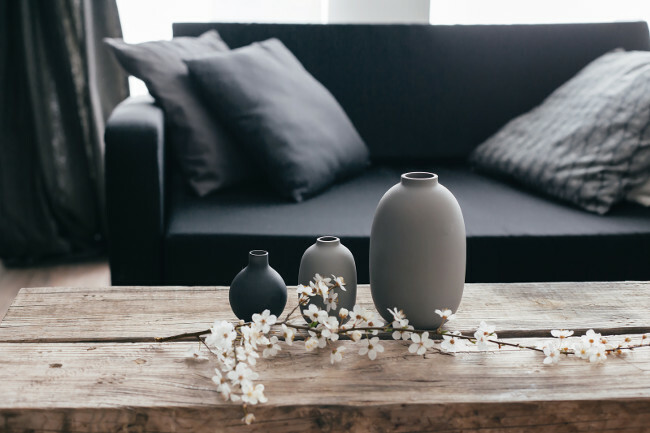 The minimalist nature of the home decor is tempered with simple elegance and a feeling of luxe comfort. This is why it’s important for the ornamentation of a room to be subtle. Even if you have a bold or eye-catching element, such as a gallery wall or a large mirror, it should not be loud or overwhelming. For instance, a gallery wall that features minimalist frames and monochromatic artwork or photographs would be preferred over something more bohemian with loud colors or mismatched frames. Often, the best way to capture the principles of hygge and lagom is to pay close attention to detail when planning out your interior design. Instead of an abundance of blankets, focus on just a few that are well-made, comforting and able to bring intimacy to the room. Another example would be to carefully choose one or two types of greenery in decorative pots rather than filling the room with a hodgepodge of plants and flowers. You could also incorporate elegantly subtle ornamentation into a room is by utilizing textured wallpapers. Wall coverings come in so many styles, patterns and textures now that they can no longer be dismissed as a gauche or outdated design element. Rather than covering all of the walls in the room, consider creating a single accent wall instead. Choose a wall covering that can add richness and interest to the room without overwhelming the rest of the decor, and arrange the rest of the lighting and furnishings to complement the wallpaper. The role of lighting in Scandinavian interior design cannot be overstated. One of the main focal points of Scandinavian home decor is making the best possible use of natural light to make a space feel bigger and brighter. However, it is just as important to have the ability to properly light a room in the absence of natural light as well. True Scandinavian style incorporates a variety of light sources so that just the right amount of atmosphere can be achieved. One popular way to do this is to have a single statement piece that acts as a primary source of light. Depending on the overall aesthetic of the room, this could be a large fabric lamp or an interesting rose gold ceiling fixture. It’s recommended to use a dimmer bulb for these lights so that you can better control the feel of the space. In addition to the main light source, you should strategically place smaller lamps, candles and other subtle lighting throughout the room. This allows you to dim or brighten certain aspects of the room according to the mood. It also gives you the option to forego the bright overhead fixture in favor of more atmospheric, intimate lighting. Don’t be afraid to experiment with various forms of lighting, including salt lamps, baseboard lights and wall-mounted fixtures. Regardless of what you choose, however, remember to stick with the principles of functionality, simple elegance and balance. We can learn a lot from Scandinavian countries when it comes to interior design. They have perfected the art of minimalist beauty while maintaining functionality, comfort and elegance. When you are looking at Nordic-inspired interior design, it is impossible to deny that it evokes a certain set of feelings. These spaces are almost always filled with clean lines, sophisticated yet inviting furnishings and an ideal balance of airiness and warmth. The minimalist nature of these spaces are balanced with the functionality of every piece and the luxe simplicity of every aspect of the design. While both hygge and lagom extend far beyond the home, it is undeniable that these principles heavily influence Scandinavian-style design principles. 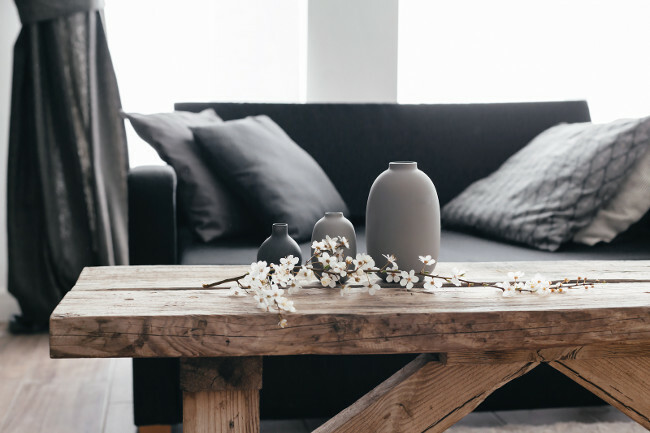 Balance, quiet luxury, understated richness and a deep sense of mindfulness are pervasive in Nordic decor, and learning how to incorporate these values with the six strategies listed above is the best way to bring Scandi chic into your own home.